For other uses, see Relic (disambiguation). In religion, a relic usually consists of the physical remains of a saint or the personal effects of the saint or venerated person preserved for purposes of veneration as a tangible memorial. Relics are an important aspect of some forms of Buddhism, Christianity, Hinduism, Islam, Shamanism, and many other religions. Relic derives from the Latin reliquiae, meaning "remains", and a form of the Latin verb relinquere, to "leave behind, or abandon". A reliquary is a shrine that houses one or more religious relics. In ancient Greece, a city or sanctuary might claim to possess, without necessarily displaying, the remains of a venerated hero as a part of a hero cult. Other venerable objects associated with the hero were more likely to be on display in sanctuaries, such as spears, shields, or other weaponry; chariots, ships or figureheads; furniture such as chairs or tripods; and clothing. The sanctuary of the Leucippides at Sparta claimed to display the egg of Leda. The bones were not regarded as holding a particular power derived from the hero, with some exceptions, such as the divine shoulder of Pelops held at Olympia. Miracles and healing were not regularly attributed to them; rather, their presence was meant to serve a tutelary function, as the tomb of Oedipus was said to protect Athens. The bones of Orestes and Theseus were supposed to have been stolen or removed from their original resting place and reburied. On the advice of the Delphic Oracle, the Spartans searched for the bones of Orestes and brought them home, without which they had been told they could not expect victory in their war against the neighboring Tegeans. Plutarch says that the Athenians were likewise instructed by the oracle to locate and steal the relics of Theseus from the Dolopians. The body of the legendary Eurystheus was also supposed to protect Athens from enemy attack, and in Thebes, that of the prophet Amphiaraus, whose cult was oracular and healing. Plutarch narrates transferrals similar to that of Theseus for the bodies of the historical Demetrius I of Macedon and Phocion the Good The bones or ashes of Aesculapius at Epidaurus, and of Perdiccas I at Macedon, were treated with the deepest veneration. As with the relics of Theseus, the bones are sometimes described in literary sources as gigantic, an indication of the hero's "larger than life" status. On the basis of their reported size, it has been conjectured that such bones were those of prehistoric creatures, the startling discovery of which may have prompted the sanctifying of the site. The head of the poet-prophet Orpheus was supposed to have been transported to Lesbos, where it was enshrined and visited as an oracle. 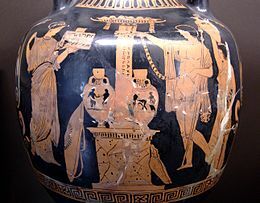 The 2nd-century geographer Pausanias reported that the bones of Orpheus were kept in a stone vase displayed on a pillar near Dion, his place of death and a major religious center. These too were regarded as having oracular power, which might be accessed through dreaming in a ritual of incubation. The accidental exposure of the bones brought a disaster upon the town of Libretha, whence the people of Dion had transferred the relics to their own keeping. According to the Chronicon Paschale, the bones of the Persian Zoroaster were venerated, but the tradition of Zoroastrianism and its scriptures offer no support of this. In Hinduism, relics are less common than in other religions since the physical remains of most saints are cremated. The veneration of corporal relics may have originated with the śramaṇa movement or the appearance of Buddhism, and burial practices became more common after the Muslim invasions. However one prominent example is the preserved body of the 11th century religious philosopher and proponent of Qualified Non-Dualism (Visishtadvaita) Swami Ramanuja in a separate shrine inside Sri Rangam Temple. In Buddhism, relics of the Buddha and various sages are venerated. After the Buddha's death, his remains were divided into eight portions. Afterward, these relics were enshrined in stupas wherever Buddhism was spread. Some relics believed to be original remains of the body of the Buddha still survive, including the much-revered Sacred Relic of the tooth of the Buddha in Sri Lanka. A stupa is a building created specifically for the relics. Many Buddhist temples have stupas and historically, the placement of relics in a stupa often became the initial structure around which the whole temple would be based. Today, many stupas also hold the ashes or ringsel of prominent/respected Buddhists who were cremated. In rare cases the whole body is conserved, for example in the case of Dudjom Rinpoche, after his death his physical body was moved a year later from France and placed in a stupa in one of his main monasteries near Boudhanath, Nepal in 1988. Pilgrims may view his body through a glass window in the stupa. The Buddha's relics are considered to show people that enlightenment is possible, to remind them that the Buddha was a real person, and to also promote good virtue. Also cited is the veneration of Polycarp's relics recorded in the Martyrdom of Polycarp (written 150–160 AD). With regard to relics that are objects, an often cited passage is Acts 19:11–12, which says that Paul's handkerchiefs were imbued by God with healing power. In the gospel accounts of Jesus healing the bleeding woman and again at Gospel of Mark 6:56, those who touched Jesus's garment were healed. The practice of venerating relics seems to have been taken for granted by writers like Augustine, St. Ambrose, Gregory of Nyssa, St. Chrysostom, and St. Gregory Nazianzen. Dom Bernardo Cignitti, O.S.B., wrote, “...[T]he remains of certain dead are surrounded with special care and veneration. This is because the mortal remains of the deceased are associated in some manner with the holiness of their souls which await reunion with their bodies in the resurrection.” Thomas Aquinas (d. 1274) pointed out that it was natural that people should treasure what is associated with the dead, much like the personal effects of a relative. In an interview with Catholic News Service, Fr. Mario Conte, executive editor of the Messenger of St. Anthony magazine in Padua, Italy, said, "Saints' relics help people overcome the abstract and make a connection with the holy. ...Saints do not perform miracles. Only God performs miracles, but saints are intercessors." In the early church the disturbance, let alone the division, of the remains of martyrs and other saints was not practiced. They were allowed to remain in their often unidentified resting places in cemeteries and the catacombs of Rome, always outside the walls of the city, but martyriums began to be built over the site of the burial, and it was considered beneficial to the soul to be buried close to the remains of saints, several large "funerary halls" being built over the sites of martyr's graves, including Old Saint Peter's Basilica. These were initially not regular churches, but "covered cemeteries" crammed with graves, and celebrating funerary and memorial services. According to the Catholic Encyclopedia it may have been thought that when the souls of the martyrs went to heaven on resurrection day they would be accompanied by those interred nearby, who would gain favour with God. The Second Council of Nicaea in 787 drew on the teaching of St. John Damascene that homage or respect is not really paid to an inanimate object, but to the holy person, and indeed the veneration of a holy person is itself honour paid to God. The Council decreed that every altar should contain a relic, making it clear that this was already the norm, as it remains to the present day in the Catholic and Orthodox churches. The veneration of the relics of the saints reflects a belief that the saints in heaven intercede for those on earth. A number of cures and miracles have been attributed to relics, not because of their own power, but because of the holiness of the saint they represent. Many tales of miracles and other marvels were attributed to relics beginning in the early centuries of the church. These became popular during the Middle Ages. These tales were collected in books of hagiography such as the Golden Legend or the works of Caesarius of Heisterbach. These miracle tales made relics much sought-after during the Middle Ages. By the late Middle Ages the collecting of, and dealing in, relics had reached enormous proportions, and had spread from the church to royalty, and then to the nobility and merchant classes. The Council of Trent of 1563 enjoined bishops to instruct their flocks that "the holy bodies of holy martyrs ... are to be venerated by the faithful, for through these [bodies] many benefits are bestowed by God on men". The council further insisted that "in the invocation of saints, the veneration of relics and the sacred use of images, every superstition shall be removed and all filthy lucre abolished." There are also many relics attributed to Jesus, perhaps most famously the Shroud of Turin, said to be the burial shroud of Jesus Christ. The cult of Martin of Tours was very popular in Merovingian Gaul, and centered at a great church built just outside the walls of Tours. When Saint Martin died November 8, 397, at a village halfway between Tours and Poitiers, the inhabitants of these cities were well ready to fight for his body, which the people of Tours managed to secure by stealth. Tours became the chief point of Christian pilgrimage in Gaul, a place of resort for the healing of the sick. Gregory of Tours had travelled to the shrine when he had contracted a serious illness. Later, as bishop of Tours, Gregory wrote extensively about miracles attributed to the intercession of St Martin. In his introduction to Gregory's History of the Franks, Ernest Brehaut analyzed the Romano-Christian concepts that gave relics such a powerful draw. He distinguished Gregory's constant usage of sanctus and virtus, the first with its familiar meaning of "sacred" or "holy", and the second as "the mystic potency emanating from the person or thing that is sacred. ... In a practical way the second word [virtus] ... describes the uncanny, mysterious power emanating from the supernatural and affecting the natural. ... These points of contact and yielding are the miracles we continually hear of". Rome became a major destination for Christian pilgrims as it was easier to access for European pilgrims than the Holy Land. Constantine erected great basilicas over the tombs of Saints Peter and Paul. A distinction of these sites was the presence of holy relics. Over the course of the Middle Ages, other religious structures acquired relics and became destinations for pilgrimage. In the eleventh and twelfth centuries, substantial numbers of pilgrims flocked to Santiago de Compostela in Spain, in which the supposed relics of the apostle James, son of Zebedee, discovered c. 830, are housed. Santiago de Compostela remains a significant pilgrimage site, with around 200,000 pilgrims, both secular and Christian, completing the numerous pilgrimage routes to the cathedral in 2012 alone. By venerating relics through visitation, gifts, and providing services, medieval Christians believed that they would acquire the protection and intercession of the sanctified dead. Relics of local saints drew visitors to sites like Saint Frideswide's in Oxford, and San Nicola Peregrino in Trani. Instead of having to travel to be near to a venerated saint, relics of the saint could be venerated locally. Relics are often kept on a circular decorated theca, made of gold, silver, or other metal. Believers would make pilgrimages to places believed to have been sanctified by the physical presence of Christ or prominent saints, such as the site of the Holy Sepulchre in Jerusalem. As holy relics attracted pilgrims and these religious tourists needed to be housed, fed, and provided with souvenirs, relics became a source of income not only for the destinations that held them, but for the abbeys, churches, and towns en route. Relics were prized as they were portable. They could be possessed, inventoried, bequeathed, stolen, counterfeited, and smuggled. They could add value to an established site or confer significance on a new location. Offerings made at a site of pilgrimage were an important source of revenue for the community who received them on behalf of the saint. According to Patrick Geary, "[t]o the communities fortunate enough to have a saint's remains in its church, the benefits in terms of revenue and status were enormous, and competition to acquire relics and to promote the local saint's virtues over those of neighboring communities was keen". Local clergy promoted their own patron saints in an effort to secure their own market share. On occasion guards had to watch over mortally ill holy men and women to prevent the unauthorized dismemberment of their corpses as soon as they died. Geary also suggests that the danger of someone murdering an aging holy man in order to acquire his relics was a legitimate concern. Relics were used to cure the sick, to seek intercession for relief from famine or plague, to take solemn oaths, and to pressure warring factions to make peace in the presence of the sacred. Courts held relics since Merovingian times. St. Angilbert acquired for Charlemagne one of the most impressive collections in Christendom. An active market developed. Relics entered into commerce along the same trade routes followed by other portable commodities. Matthew Brown likens a ninth-century Italian deacon named Deusdona, with access to the Roman catacombs, as crossing the Alps to visit monastic fairs of northern Europe much like a contemporary art dealer. Canterbury was a popular destination for English pilgrims, who traveled to witness the miracle-working relics of Thomas Becket, the sainted archbishop of Canterbury who was assassinated by knights of King Henry II in 1170. After Becket's death his successor and the Canterbury chapter quickly used his relics to promote the cult of the as-yet-uncanonized martyr. The motivations included the assertion of the Church's independence against rulers, a desire to have an English (indeed Norman English) saint of European reputation, and the desire to promote Canterbury as a destination for pilgrimage. In the first years after Becket's death, donations at the shrine accounted for twenty-eight percent of the cathedral's total revenues. Many churches were built along pilgrimage routes. A number in Europe were either founded or rebuilt specifically to enshrine relics, (such as San Marco in Venice) and to welcome and awe the large crowds of pilgrims who came to seek their help. Romanesque buildings developed passageways behind the altar to allow for the creation of several smaller chapels designed to house relics. From the exterior, this collection of small rooms is seen as a cluster of delicate, curved roofs at one end of the church, a distinctive feature of many Romanesque churches. Gothic churches featured lofty, recessed porches which provided space for statuary and the display of relics. Historian and philosopher of art Hans Belting observed that in medieval painting, images explained the relic and served as a testament to its authenticity. In Likeness and Presence, Belting argued that the cult of relics helped to stimulate the rise of painting in medieval Europe. Reliquaries are containers used to protect and display relics. While frequently taking the form of caskets, they have many other forms including simulations of the relic encased within (e.g., a gilded depiction of an arm for a relic consisting of arm bones). 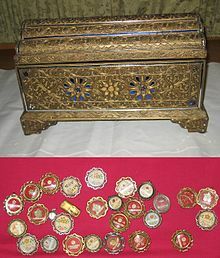 Since the relics themselves were considered valuable, they were enshrined in containers crafted of or covered with gold, silver, gems, and enamel. Ivory was widely used in the Middle Ages for reliquaries; its pure white color an indication of the holy status of its contents. These objects constituted a major form of artistic production across Europe and Byzantium throughout the Middle Ages. In the absence of real ways of assessing authenticity, relic-collectors became prey to the unscrupulous, and some extremely high prices were paid. Forgeries proliferated from the very beginning. Augustine already denounced impostors who wandered around disguised as monks, making a profit from the sale of spurious relics. In his Admonitio Generalis of 789, Charlemagne ordered that "the false names of martyrs and the uncertain memorials of saints should not be venerated". The Fourth Lateran Council (1215) of the Church condemned abuses such as counterfeit relics and exaggerated claims. Pieces of the True Cross were one of the most highly sought after of such relics; many churches claimed to possess a piece of it, so many that John Calvin famously remarked that there were enough pieces of the True Cross to build a ship from. A study in 1870 found that, put together, the claimed relics of the cross at that much later time weighed less than 1.7 kg. Due to the existence of some counterfeit relics, the Church began to regulate the use of relics. Canon Law required the authentication of relics if they were to be publicly venerated. They had to be sealed in a reliquary and accompanied by a certificate of authentication, signed and sealed by someone in the Congregation for Saints, or by the local Bishop where the saint lived. Without such authentication, relics are not to be used for public veneration. The Congregation for Saints, as part of the Roman Curia, holds the authority to verify relics in which documentation is lost or missing. The documents and reliquaries of authenticated relics are usually affixed with a wax seal. In Catholic theology, sacred relics must not be worshipped, because only God is worshipped and adored. Instead, the veneration given to them was "dulia". Saint Jerome declared, "We do not worship, we do not adore, for fear that we should bow down to the creature rather than to the Creator, but we venerate the relics of the martyrs in order the better to adore Him whose martyrs they are." First-Class Relics: items directly associated with the events of Christ's life (manger, cross, etc.) or the physical remains of a saint (a bone, a hair, skull, a limb, etc.). Traditionally, a martyr's relics are often more prized than the relics of other saints. Parts of the saint that were significant to that saint's life are more prized relics. For instance, King St. Stephen of Hungary's right forearm is especially important because of his status as a ruler. A famous theologian's head may be his most important relic. (The head of St. Thomas Aquinas was removed by the monks at the Cistercian abbey at Fossanova where he died.) If a saint did a lot of traveling, then the bones of his feet may be prized. Catholic teaching prohibits relics to be divided up into small, unrecognizable parts if they are to be used in liturgy (i.e., as in an altar; see the rubrics listed in Rite of Dedication of a Church and an Altar). Second-Class Relics: items that the saint owned or frequently used, for example, a crucifix, rosary, book, etc. Again, an item more important in the saint's life is thus a more important relic. Sometimes a second-class relic is a part of an item that the saint wore (a shirt, a glove, etc.) and is known as ex indumentis ("from the clothing"). Third-Class Relics: any object that is touched to a first- or second-class relic. Most third-class relics are small pieces of cloth, though in the first millennium oil was popular; the Monza ampullae contained oil collected from lamps burning before the major sites of Christ's life, and some reliquaries had holes for oil to be poured in and out again. Many people call the cloth touched to the bones of saints "ex brandea". But ex brandea strictly refers to pieces of clothing that were touched to the body or tombs of the apostles. It is a term that is used only for such; it is not a synonym for a third-class relic. The sale or disposal by other means of relics without the permission of the Apostolic See is nowadays strictly forbidden by canon 1190 of the Code of Canon Law. Relics may not be placed upon the altar for public veneration, as that is reserved for the display of the Blessed Sacrament (host or prosphora and Eucharistic wine after consecration in the sacrament of the Eucharist). The importance of relics in the Byzantine world can be seen from the veneration given to the pieces of the True Cross. Many great works of Byzantine enamel are staurothekes, or relics containing fragments of the True Cross. Other significant relics included the girdle worn by the Virgin, and pieces of the body or clothing of saints. Such relics (called contact relics, or secondary relics) were, however, scarce and did not provide most believers with ready access to proximity to the holy. The growth in the production and popularity of reproducible contact relics in the fifth and sixth centuries testifies to the need felt for more widespread access to the divine. These contact relics usually involved the placing of readily available objects, such as pieces of cloth, clay tablets, or water then bottled for believers, in contact with a relic. Alternatively, such objects could be dipped into water which had been in contact with the relic (such as the bone of a saint). These relics, a firmly embedded part of veneration by this period, increased the availability of access to the divine but were not infinitely reproducible (an original relic was required), and still usually required believers to undertake pilgrimage or have contact with somebody who had. The earliest recorded removal, or translation of saintly remains was that of Saint Babylas at Antioch in 354, but, partly perhaps because Constantinople lacked the many saintly graves of Rome, they soon became common in the Eastern Empire, though still prohibited in the West. The Eastern capital was therefore able to acquire the remains of Saints Timothy, Andrew and Luke, and the division of bodies also began, the 5th century theologian Theodoretus declaring that "Grace remains entire with every part". In the West a decree of Theodosius only allowed the moving of a whole sarcophagus with its contents, but the upheavals of the barbarian invasions relaxed the rules, as remains needed to be relocated to safer places. The veneration of relics continues to be of importance in the Eastern Orthodox Church. As a natural outgrowth of the concept in Orthodox theology of theosis, the physical bodies of the saints are considered to be transformed by divine grace — indeed, all Orthodox Christians are considered to be sanctified by living the mystical life of the Church, and especially by receiving the Sacred Mysteries (Sacraments). In the Orthodox service books, the remains of the departed faithful are referred to as "relics", and are treated with honour and respect. For this reason, the bodies of Orthodox Christians are not traditionally embalmed. The veneration of the relics of the saints is of great importance in Orthodoxy, and very often churches will display the relics of saints prominently. In a number of monasteries, particularly those on the Holy Mountain (Mount Athos in Greece), all of the relics the monastery possesses are displayed and venerated each evening at Compline. As with the veneration of icons, the veneration (Greek; δουλια, dulia) of relics in the Orthodox Church is clearly distinguished from adoration (λατρεια, latria); i.e., that worship which is due to God alone. Thus Orthodox teaching warns the faithful against idolatry and at the same time remains true to scriptural teaching (vis. 2 Kings 13:20–21) as understood by Orthodox Sacred Tradition. The examination of the relics is an important step in the glorification (canonization) of new saints. Sometimes, one of the signs of sanctification is the condition of the relics of the saint. Some saints will be incorrupt, meaning that their remains do not decay under conditions when they normally would (natural mummification is not the same as incorruption)[clarification needed]. Sometimes even when the flesh does decay the bones themselves will manifest signs of sanctity. They may be honey colored or give off a sweet aroma. Some relics will exude myrrh. The absence of such manifestations is not necessarily a sign that the person is not a Saint. Relics play a major role in the consecration of a church. The consecrating bishop will place the relics on a diskos (paten) in a church near the church that is to be consecrated, they will then be taken in a cross procession to the new church, carried three times around the new structure and then placed in the Holy Table (altar) as part of the consecration service. 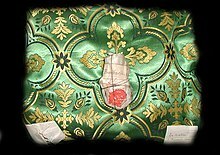 The relics of saints (traditionally, always those of a martyr) are also sewn into the antimension which is given to a priest by his bishop as a means of bestowing faculties upon him (i.e., granting him permission to celebrate the Sacred Mysteries). The antimens is kept on the High Place of the Holy Table (altar), and it is forbidden to celebrate the Divine Liturgy (Eucharist) without it. Occasionally, in cases of fixed altars, the relics are built in the altar table itself and sealed with a special mixture called wax-mastic. The necessity of provide relics for antimensions in new churches often necessitates continuous division of relics. An account of this process can be found in a treatise of a pre-revolutionary Russian church historian Nikolay Romansky (ru). According to Romansky, the Holy Synod of the Russian Orthodox Church operated a special office, located in the Church of Philip the Apostle in the Moscow Kremlin, where bones of numerous saints, authenticated by the church's hierarchs, were stored, and pieces of them were prayerfully separated to be sent to the dioceses that needed to place them into new antimensions. While Orthodoxy does not make use of the strict classification system of the Roman Catholic Church, it too recognizes and venerates relics which may pertain to Jesus Christ or a saint, such as a relic of the True Cross, the Chains of Saint Peter (feast day, 16 January), the grapevine cross of Saint Nino of Georgia, etc. Places can also be considered holy. When one makes a pilgrimage to a shrine he may bring back something from the place, such as soil from the Holy Land or from the grave of a saint. The Seamless robe of Jesus is kept in a purpose-built chapel in Trier Cathedral. The Sandals of Jesus Christ were donated to Prüm Abbey, Germany, by popes Zachary and Stephen II in the 8th century. The Marienschrein in Aachen Cathedral contains four important relics: the nappy and loin cloth of Jesus, the dress of Mary and the decapitation cloth of John the Baptist. The Karlsschrein in the same church contains the remains of Charlemagne, who was locally venerated at a saint. The Girdle of Mary is kept in the Basilica of Our Lady in Maastricht, Netherlands. The Shrine of the Three Kings in Cologne Cathedral contains the remnants of the biblical Magi. St Peter's Basilica in the Vatican contains Saint Peter's relics. The Apostle Paul's relics are allegedly contained in the Basilica of Saint Paul. St Mark's relics are held at St Mark's Basilica in Venice. St James' relics are reputedly held at the Cathedral of Santiago de Compostela, Spain. St Andrew's relics are contained in the Basilica of St Andrew in Patras, Greece. St John the Evangelist's tomb is purported to be in the Basilica of St. John at Ephesus in Turkey. Relics claimed to be those of John the Baptist were discovered in a Bulgarian monastery in 2010. Many other churches claim to have remains of John the Baptist, especially of his skull. Reliquary arms of Saint Thomas the Apostle can be found in churches around the globe. Most contain only a fragment of the arm that allegedly touched Christ's side wound after the Resurrection. Saint Thomas Aquinas' relics are contained in the Church of the Jacobins, Toulouse, France. Saint Francis of Assisi's relics are enshrined in the Basilica of Saint Francis in Assisi, Italy. Saint Catherine of Siena's head is stored in San Domenico church, Siena, with her body in Santa Maria sopra Minerva Church in Rome. Saint George's arm is kept in Lod, Poland. Saint Servatius' relics are largely kept in a gilded chest and bust in the Basilica of Saint Servatius in Maastricht, Netherlands. Some of his relics are in Tongeren, Belgium, and Quedlinburg, Germany. Saint Lambert's skull is contained in a reliquary bust in Liège Cathedral, Belgium. Saint Hubert's remains were enshrined in the Abbey of Saint-Hubert, Belgium. Saint Willibrord's remains are in Echternach, Luxemburg. Blessed Mary of the Divine Heart relics and incorrupt body are exposed in the Church of the Sacred Heart of Jesus in Ermesinde, Portugal. The veneration of the relics of saints became an incredibly important part of devotional piety in both Sunni and Shia Islam throughout the classical and medieval periods, with "the ubiquity of relics and ritual practices associated with them" becoming a mainstay of "the devotional life of the Muslims ... [all over the world but particularly in] the Near East and North Africa." With the latter-day influence of the reformist movements of Salafism and Wahhabism, there is, according to some scholars, an erroneous perception which persists both among some modern Muslims and Western observers opining that "the Islamic experience['s relationship with relic-veneration] is marginal, because of the perceived absence of relics in Islam." It is, however, evident that "the historical reality of relics in Islam" was very different, and that the classical Islamic thinkers posed various reasons for why the veneration of the relics of prophets and saints was permissible. While various relics are preserved by different Muslim communities, the most important are those known as The Sacred Trusts, more than 600 pieces treasured in the Privy Chamber of the Topkapı Palace Museum in Istanbul. Most of the trusts can be seen in the museum, but the most important of them can only be seen during the month of Ramadan. The Qur'an has been recited next to these relics uninterruptedly since they were brought to the Topkapı Palace, but Muslims do not worship these relics. A cloak (kherqa) believed to have belonged to the prophet Mohammed is kept in the central mosque in Kandahar, Afghanistan. According to local history, it was given to Ahmad Shah by Mured Beg, the Emir of Bokhara. The Sacred Cloak is kept locked away, taken out only at times of great crisis. In 1996 Mullah Omar, leader of the Afghan Taliban, took it out, displayed it to a crowd of ulema (religious scholars) and was declared Amir-ul Momineen ("Commander of the Faithful"). Prior to this, the last time it had been removed had been when the city was struck by a cholera epidemic in the 1930s." A contact relic, or secondary relic, is a physical object which has acquired the status of a relic due to a physical closeness to the body of a holy figure. While Marxism–Leninism is an ideology rather than a religion, many communist states placed importance on the preservation of the remains of their respective founders, and making them available for veneration by citizens, in "secular cathedrals" of sorts. In both the Soviet Union and the People's Republic of China the mausolea of, respectively, Vladimir Lenin and Mao Zedong were the focal points of the two nations' capitals. The communists did not rely on the natural incorruptibility of the remains, but used an elaborate embalming process to preserve the lifelike appearance of the bodies. Minor communist nations would often seek the help of the USSR or PRC to preserve the remains of their own founders in a similar way to how it was done in Moscow or Beijing. See Georgi Dimitrov Mausoleum (Bulgaria, 1949), Ho Chi Minh Mausoleum (Vietnam, 1973), Kumsusan Memorial Palace (North Korea, 1994). The bodies of the founders of the socialist Czechoslovakia, Mongolia, and Angola were also at some point made available for display and veneration in similar mausolea. Even though Soviet Communism is commonly viewed as anti-religious in general, and anti-Christian in particular, parallels between the veneration of Lenin's body in his mausoleum (and, for a while, that of Stalin's body as well) and that of the relics of Christian saints in their reliquaries have not been lost on many observers. It is said that in the 1940s, some visitors to the mausoleum would cross themselves, as if entering a church. Even decades after the fall of communism, Russia's president would on occasion compare Lenin's body to the relics of Christian saints found in various monasteries. Relic is also the term for something that has survived the passage of time, especially an object or custom whose original culture has disappeared, but also an object cherished for historical or memorial value (such as a keepsake or heirloom). "Cultural relic" is a common translation for "Wenwu" (文物), a common Chinese word that usually means "antique" but can be extended to anything, including object and monument, that is of historical and cultural value. However, this has some issues since 文物 has little resemblance to the English usage of "relic". In most cases, artifact, archaeological site, monument, or just plain archaeology would be a better translation. ^ Gunnel Ekroth, "Heroes and Hero-Cult", in A Companion to Greek Religion (Blackwell, 2010), pp. 110–111. ^ a b Ekroth, "Heroes and Hero-Cult", pp. 110–111. ^ Ruth Fainlight and Robert J. Littman, The Theban Plays: Oedipus the King, Oedipus at Colonus, Antigone (Johns Hopkins University Press, 2009), p. xii. ^ Susan E. Alcock, "Tomb Cult and the Post-Classical Polis", American Journal of Archaeology 95 (1991), p. 447. ^ Herodotus, Histories 1.46, as cited by Fainlight and Littman, The Theban Plays, p. xii. ^ Plutarch, Theseus 36, Bill Thayer's edition of the Loeb Classical Library translation at LacusCurtius. ^ Euripides, Heracleides 1032–34; Aeschylus, Eumenides 763ff. ^ Herodotus, Histories 8.134 and Aeschylus, Seven Against Thebes 587–588, as cited by Fainlight and Littman, The Theban Plays, p. xii. ^ Plutarch, Demetrius 53 and Phocion 37–38, English translations at LacusCurtius. ^ Philostratus, Heroicus 5.3 and Life of Apollonius 4.14; Joseph Falaky Nagy, "Hierarchy, Heroes, and Heads: Indo-European Structures in Greek Myth", in Approaches to Greek Myth (Johns Hopkins University Press, 1990), pp. 210–212. Ancient Greek vase paintings also depict the head of Orpheus prophesying. ^ Pausanias 9.30.4–5, as cited and discussed by Nagy, pp. 212. ^ Aymard, Orianne (2014). When a Goddess Dies: Worshipping Ma Anandamayi after Her Death. Oxford University Press. p. 71. ISBN 0199368635. ^ a b c "Relics". Archived from the original on 2016-03-01. ^ "Catholic News - Saints' Relics Help People Make Connection to the Holy - American Catholic". ^ a b c "Pilgrimage in Medieval Europe". The Met’s Heilbrunn Timeline of Art History. ^ Beardsley, Eleanor. "An Ancient Religious Pilgrimage That Now Draws The Secular". NPR. Retrieved 20 April 2015. ^ "The pilgrimage routes to Santiago de Compostela in Pictures". Camino de Santiago. ^ "Relics and Reliquaries in Medieval Christianity". The Met’s Heilbrunn Timeline of Art History. ^ "AmericanCatholic.Org". AmericanCatholic.Org. Retrieved 10 May 2015. ^ Jerome, Ad Riparium, i, P.L., XXII, 907. ^ "The ''Code of Canon Law''". Vatican.va. Archived from the original on 2013-03-03. Retrieved 2013-03-04. ^ "Venerating Relics at Mass". ^ Tomov, Nikola; Dzhangozov, Januarius (Yanko). "Wax Embedding as a Method for Preservation of Body Relics Used by the Orthodox Church" (PDF). Acta Morphologica et Anthropologica. 25 (1–2): 122-125. ^ "Relics of St Paul discovered". Independent Catholic News. ^ Lamb, Christina (2002). The Sewing Circles of Herat. HarperCollins. First Perennial edition (2004), p. 38 and n. ISBN 0-06-050527-3. ^ Clifton, James (2014). "Conversations in Museums". In Sally M. Promey. Sensational Religion: Sensory Cultures in Material Practice. Yale UP. pp. 205–14. ISBN 9780300187359. ^ a b "Who, What, Why: How do you embalm a leader?". BBC News. Look up relic in Wiktionary, the free dictionary. Wikimedia Commons has media related to Relics. 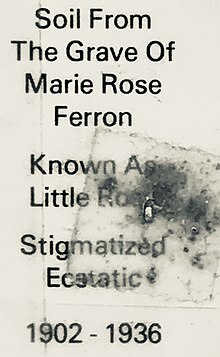 "Relics" . Catholic Encyclopedia. 1913. "Relics" . Encyclopædia Britannica (11th ed.). 1911. According to apocryphal Christian and Islamic tradition, Saint Anne was the mother of Mary and grandmother of Jesus. Mary's mother is not named in the canonical gospels nor in the Qur'an. In writing, Anne's name and that of her husband Joachim come only from New Testament apocrypha, of which the Gospel of James seems to be the earliest that mentions them. 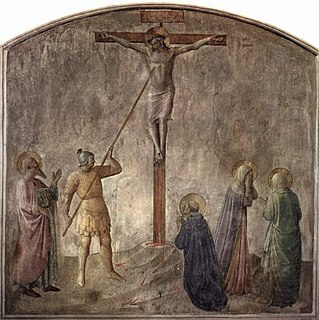 Longinus is the name given to the unnamed Roman soldier who pierced Jesus in his side with a lance and who in medieval and some modern Christian traditions is described as a convert to Christianity. It first appeared in the apocryphal Gospel of Nicodemus. The lance is called in Christianity the "Holy Lance" (lancea) and his story is related in the Latin Vulgate Bible during the Crucifixion. This act is said to have created the last of the Five Holy Wounds of Christ. James, son of Zebedee was one of the Twelve Apostles of Jesus, traditionally considered the first apostle to be martyred. The True Cross is the name for physical remnants which, by the tradition of most Christian Churches, are said to be from the cross upon which Jesus was crucified. According to three of the Gospels, a woven crown of thorns was placed on the head of Jesus during the events leading up to the crucifixion of Jesus. It was one of the instruments of the Passion, employed by Jesus' captors both to cause him pain and to mock his claim of authority. It is mentioned in the gospels of Matthew, Mark (15:17) and John and is often alluded to by the early Church Fathers, such as Clement of Alexandria, Origen and others. A reliquary is a container for relics. These may be the purported or actual physical remains of saints, such as bones, pieces of clothing, or some object associated with saints or other religious figures. The authenticity of any given relic is often a matter of debate; for that reason, some churches require documentation of the relic's provenance. Incorruptibility is a Roman Catholic and Eastern Orthodox belief that divine intervention allows some human bodies to avoid the normal process of decomposition after death as a sign of their holiness. Bodies that undergo little or no decomposition, or delayed decomposition, are sometimes referred to as incorrupt or incorruptible. Saints Gervasius and Protasius are venerated as Christian martyrs, probably of the 2nd century. They are the patron saints of Milan and of haymakers and are invoked for the discovery of thieves. Their feast day in the Latin Rite of the Catholic Church is 19 June, the day marking the translation of their relics. In the Eastern Orthodox Church and in the Eastern Rites of the Catholic Church, their feast takes place on 14 October (O.S. )/24 October (N.S. ), the traditional day of their death. In Christian iconography their emblems are the scourge, the club and the sword. 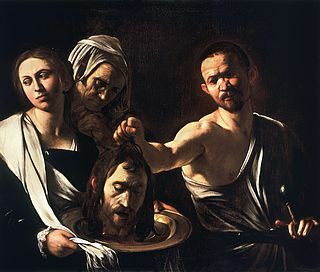 The Beheading of Saint John the Baptist, also known as the Decollation of Saint John the Baptist or the Beheading of the Forerunner, is a biblical event and holy day observed by various Christian churches that follow liturgical traditions. The day commemorates the martyrdom by beheading of Saint John the Baptist on the orders of Herod Antipas through the vengeful request of his step-daughter Salome and her mother Herodias. Saint Valeria of Milan, or Saint Valérie, according to Christian tradition, was the wife of Vitalis of Milan and the mother of Sts. Gervasius and Protasius. Saint Caesarius of Africa, also Caesarius of Terracina was a Christian martyr. The church of San Cesareo in Palatio in Rome bears his name. In Christianity, the translation of relics is the removal of holy objects from one locality to another ; usually only the movement of the remains of the saint's body would be treated so formally, with secondary relics such as items of clothing treated with less ceremony. Translations could be accompanied by many acts, including all-night vigils and processions, often involving entire communities. Magnificent Corpses: Searching Through Europe for St. Peter's Head, St. Claire's Heart, St. Stephen's Hand, and Other Saintly Relics (1999) is a book written by Anneli Rufus, concerning relics enshrined in Europe's churches and cathedrals. Rufus relates the stories behind the saints memorialized and the history of relic veneration. As a non-Catholic, she also describes her experiences of visiting the reliquaries of various saints and the pilgrims that still visit them. Stephen, traditionally venerated as the protomartyr or first martyr of Christianity, was according to the Acts of the Apostles a deacon in the early church at Jerusalem who aroused the enmity of members of various synagogues by his teachings. Accused of blasphemy at his trial, he made a long speech denouncing the Jewish authorities who were sitting in judgment on him and was then stoned to death. His martyrdom was witnessed by Saul of Tarsus, a Pharisee who would later become a follower of Jesus and known as Paul the Apostle. Sicarius of Brantôme or Sicarius of Bethlehem was a child saint who was venerated from the time of Charlemagne onwards as one of the victims of the Massacre of the Innocents by Herod the Great, said to have occurred in Bethlehem at the time of the birth of Jesus. His remains are housed in the Abbey of Saint-Pierre in Brantôme, Dordogne, France. The Pilgrimage of the Relics or Maastricht Septennial Pilgrimage is a seven-yearly Catholic event in the Dutch city of Maastricht. Originating in the Middle Ages, it developed from a pilgrimage to the grave of Saint Servatius into the present-day religious, historical, cultural and commercial enterprise. Highlights in the programme are the displaying or unveiling of the relics in the main churches and secondly, the processions with the town's main relics. The next pilgrimage will take place in 2025.